Tables made from recycled plastic will be a lifetime purchase. Made from recycled plastic lumber, also known as recycled plastic wood, they do not rot and are easy to clean. 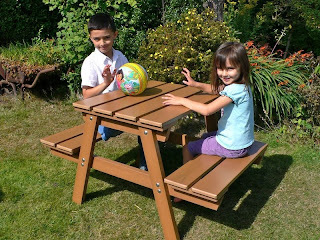 Recycled Plastic Table - Kids Enjoying! Buying recycled plastic tables compared to a traditional wooden table has numerous benefits. The positive impact this one decision has on the environment is tremendous. Along with the environmental benefits the advantages to the individual owners when dealing with maintenance is compelling in its own right. A great way man can live alongside Mother Nature is to purchase products made with recycled materials. It takes over 450 years for a single water bottle to decompose in the ground. A recycled plastic table eliminates excess waste in our landfills such as water bottles, milk jugs, and laundry detergent bottles. With the growing shortage of space used for the trash all around the world, this type of recycling is an important step in preserving our world and its natural beauty. When using recycled materials you are also reducing pollution and conserving energy that would otherwise be used while making new plastic. No trees are harvested during the process of making a recycled plastic table. This not only affects the trees themselves but also the animals that live in them. Being made completely of plastic also eliminates any chance of the table rotting, splitting, or causing splinters. There is no worry of insect damage or infestation. The recycled plastic table does not appeal to the appetite of the termite as a wooden table does. It is also virtually impossible for carpenter ants to excavate the plastic to create nesting areas to live in. So there is no need to treat the table with harmful chemicals that would leach into the ground and eventually into the water. 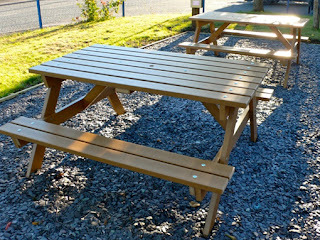 Recycled plastic tables are virtually maintenance free. The only upkeep needed is the occasional wash with ordinary dish soap and water. They are completely waterproof so there is no need to seal them with a clear coat of any kind and that also eliminates the environmental hazards that sealants cause when they are absorbed into the ground. The appearance of a recycled plastic tables last much longer than one made of wood. The colour is throughout the entire piece not just on the top layer. There is no need to re-paint or stain as the colour cannot be worn away or faded as is usual in wooden tables. The longevity of the table is impressive. The aesthetics of a recycled plastic table are not in any way compromised. There is a large variety of finishes offered by different companies. There are also several authentic wood- like finishes such as cedar, pine, or even weathered wood and the colours offered are endless. They come in many shapes and sizes and are also wheel chair accessible. 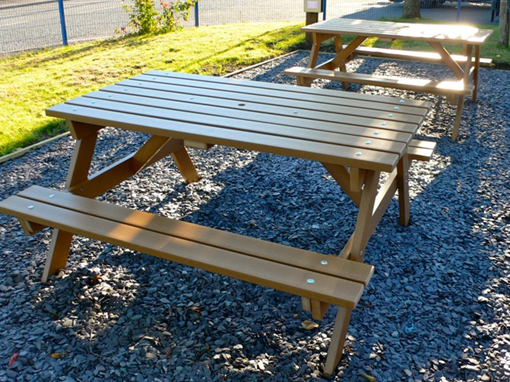 Not only does a recycled plastic table maintain its appearance for several years it also has many other benefits. It would save countless trees and in turn save many habitats of the animals. The upkeep for the owner is minimal and will save them time and money. When you purchase one of these tables you can obtain the functionality and appearance you were going for all while helping the environment.